Prionostemma sp., copyright Daniel N. Proud. 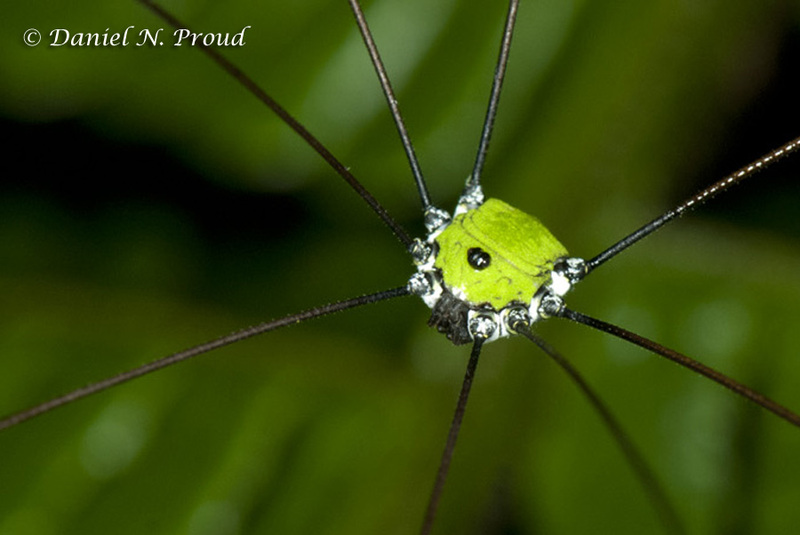 Prionostemma is a genus of sclerosomatid harvestmen recognised from Central and South America, the defining characters of which remain poorly defined. Characters (from Roewer 1923): Eyemound as long as high and wide or wider, dorsally smooth or granular. Scutum unarmed. Lateral margins of coxae with sharp, three-pointed denticulations. Legs very long and thin; femur II 2–3 (or more) times and femora I and III 1.5–2 times as long as body; femora I–IV with nodular formula 0.3.0.1. [GG42a] Goodnight, C. J., & M. L. Goodnight. 1942a. Phalangids from British Guiana. American Museum Novitates 1167: 1–13. [GG42b] Goodnight, C. J., & M. L. Goodnight. 1942b. Phalangida from Barro Colorado Island, Canal Zone. American Museum Novitates 1198: 1–18.